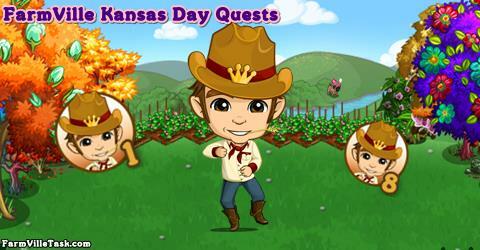 Join our friend Johnny Hoedown in FarmVille Kansas Day Quests. He is very excited for the upcoming event and he is asking if we could help him to shop for the materials that he will need for the event. He’s been planning for this event since last year. On this FarmVille Quests, we will have 9 recipes to craft at the BAKERY, SPA or WINERY. We can gather the bushels early and reserve them. You can also use the Bushel Swap feature to collect the bushels. Note: Expected to be release on Thursday (January 18). Info: Crafted at the BAKERY and will need Kidney Bean x4 and Pepper x4. Info: Crafted at the WINERY and will need Frozen Grapes x2, Wheat x2 and Blueberry x3. Info: Crafted at the SPA and will need Pumpkin x3, Cranberry x3 and Sunflower x3. Info: Crafted at the BAKERY and will need Spinach x4, Onion x2 and Tomato x4. Info: Crafted at the WINERY and will need Oyster x4, Rice x3 and Ghost Chili x4. Info: Crafted at the SPA and will need Mint Candy x2, Aloe Vera x3 and Lilac x3. Info: Crafted at the BAKERY and will need Broccoli x3, Carrot x4 and Wheat x3. Info: Crafted at the WINERY and will need Raspberry x3, Blackberry x2, Grape x2. Info: Crafted at the SPA and will need Lily x1, Blueberry x3, Morning Glory x3.